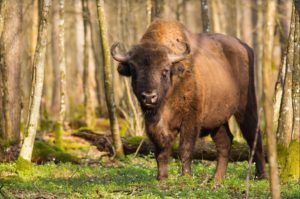 This tour brings you up close to the realm the Żubr (European bison), in an area of pristine nature where the forest is thickest. Even for the Poles, the northeastern frontier is a fairytale-like melting pot because it is a unique patchwork consisting of Polish, Belarus, Lithuanian, Jewish and Tartar cultures. It represents Poland from a distant past when it was governed under the Polish-Lithuanian Commonwealth. Though it is off-the-beaten track, the tour is relaxing and serene. The journey passes through some of the most photogenic rural landscapes in Eastern Europe. 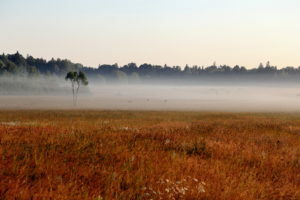 The Best Of Lithuania & Eastern Poland is our only tour that crosses state borders. However, the borders are almost invisible because Poland and Lithuania are now in the EU. You will visit another exciting country and its capital, Vilnius, which has biggest old town in Eastern Europe. This will enable you to compare another old European city with Krakow. You can be assured that you will be exploring a very unspoiled and safe area under the professional guidance of a StayPoland tour leader. Morning: After breakfast we set off from Warsaw to the east of Poland. The first stop is Treblinka, where we will visit the poignant remains of the second biggest Nazi German extermination camp. Afternoon: Lunch break in Ciechanowiec, a small town that was inhabited mostly by Jews before World Word II. We then continue our journey to Hajnowka, one of the key centres of Orthodox Christian faith in Poland. The town’s Holy Trinity Orthodox Church is an excellent example of the contemporary architecture. Evening: We reach Bialowieza, a picturesque village located in the middle of Bialowieza Forest and famous for its regional wooden architecture. Early Morning: A walk in the Strictly Protected Area to explore the beauty of untouched nature in a multi-species forest with trees that are more than 400-years old. It is one of the last primeval forests in Europe. Afternoon: We continue our walking tour in the Palace Park and see a 19th century Orthodox Church. This is followed by a visit to the famous European Bison Show Reserve, where the restituted bison (saved from near extinction) live in semi-wild conditions. Evening: Overnight stay in Białowieża and dinner at a fine local restaurant. 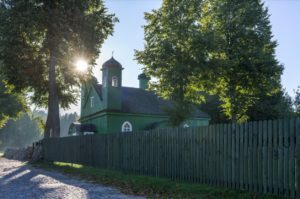 Morning: After breakfast, we drive to Kruszyniany, a village famous for a minor Tatar community and an agritourism cottage run by the Bogdanowicz family. This village was a highlight in Prince Charles’ 2010 trip to Poland. We visit an original wooden mosque and learn about the history of the Tatars in the area. We then participate in a regional cuisine cooking workshop (dishes include pierekaczewnik – pasta layered with beef), followed by a Tatar-Polish lunch. Afternoon: We start our drive to Lithuania, passing through the scenic landscapes of Suwalki Region and Dzukija. Evening: On reaching Vilnius, the capital of Lithuania, we check into a comfortable centrally located hotel where we will stay for three nights. Morning: After breakfast, we begin our tour of Vilnius, the capital and the largest city in Lithuania. 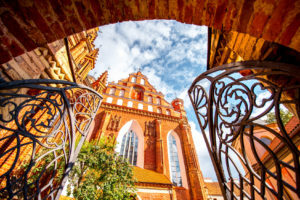 This enchanting city features a number of unique monuments, in particular the Cathedral built on the former site of pagan temple, the famous Gate of Dawn (the pilgrimage point for many generations of Poles), one of the oldest European universities, the Gothic St. Anne’s Church, and the classical Town Hall. Afternoon: We wander along the charming, crooked lanes of Vilnius to find lunch and coffee in the idyllic atmosphere of the historical core of the city. Optionally, you can visit the Rasos Cemetery, a touching site and the final resting place of Polish And Lithuanian statesmen. Evening: A dinner of local cuisine in one of the finest restaurants in the Old Town.